I gave in this year and bought one of the over-priced Elf on the Shelf kits. I opted for the dark skin, brown-eyed elf, though I'm not sure the manufacturer's version of "dark skin" is very authentic. When he arrived, I jazzed up his boring little ensemble as a way to explain away any other elves we may see in the store. Though I don't plan to outright lie to her, I thought it might be easier for my child to imagine her elf is "real" if he is different from the mass-produced stack we see at Target or Hallmark. As part of the bigger plan, perhaps next Christmas Santa will assign a different elf... provided her imagination is still willing and able to believe in a magical Christmas elf. Fingers crossed! I'm not a fan of the story that comes with the elves, so I ditched it for my own little note from our ethnically diverse elf, Fernando. Okay, so this probably falls into the category of LIE. [Gasp!] But, Fernando's entrance into our holiday has been fun and exciting for the whole family...so far, no regrets! Janie Kathryn first found Fernando after visiting Santa at our local mall. We always visit Santa during the first few days of December to lock in those Christmas wishes! When we returned, Fernando was there with a special note for JK. Note the rule about not leaving the house. This is key to keeping Fernando from going to go to school! After his first night at the house, we awoke to this mess in the playroom. One might think this is a counterproductive tradition. However, my child made her bed, thinking that Fernando was lost in the sheets. (This trick only works once.) She also cleaned up after the sneaky little elf and learned how to create her own snowflakes. Success! The next night, it seems that Fernando opened one of Janie Kathryn's gifts. He got himself into a little trouble too! 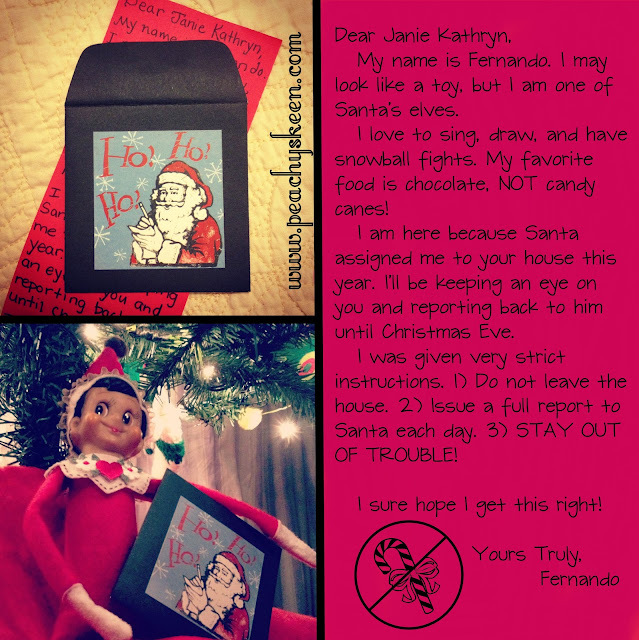 Bright and early, Janie Kathryn found him and woke me up to tell me how Fernando DID NOT stay out of trouble! I think this is going to be even more fun than I anticipated! Setting up house at Barbie's. The one night that he actually stayed on the shelf. He wrote out the weekly spelling words, adding a few of his own. Fashion show or all male review? Welcome to my collection of lemonade stand projects. Our family has really enjoyed using our lemonade stand to help others. I hope you can find some good ideas! You can read the full story of this project here. 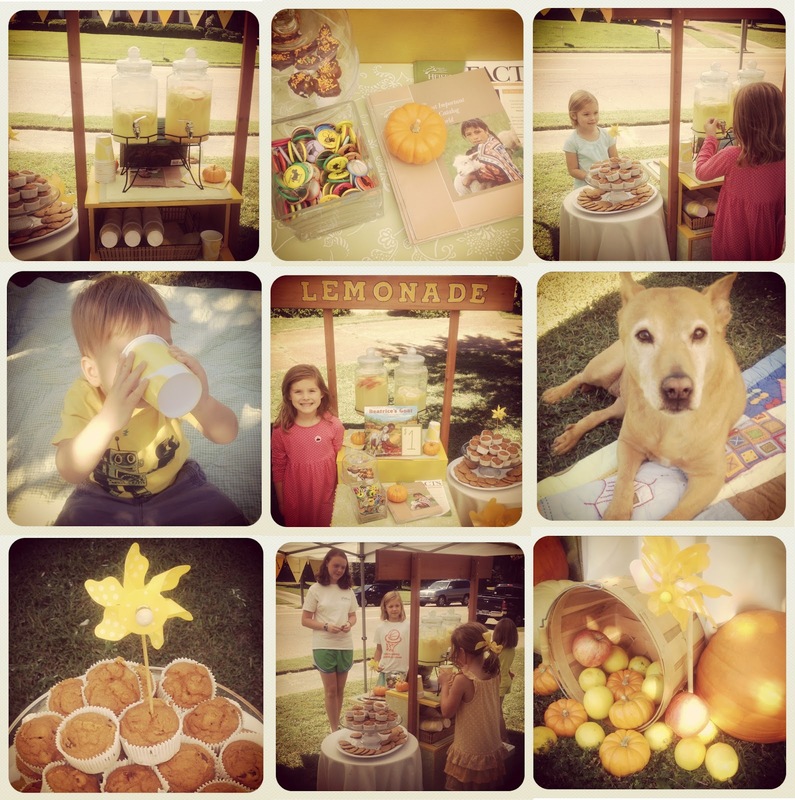 We rolled out the lemonade stand on the first day of fall to raise money for Heifer International. I used a combination of pumpkins, lemons, and apples to style the stand. Nothing welcomes fall better than pumpkin baked goods. I baked these pumpkin muffins to compliment our lemonade selection. We also served oatmeal cookies, to which I added a little lemon zest and cranberries, keeping with our cohesive autumnal lemonade theme. Mix together and bake at 350 degrees for 20-25 minutes. I was pressed for time and used a package of oatmeal cookie mix. I added the zest of one lemon and a cup of cranberries to dress them up a bit. We served two types of lemonade, a traditional lemonade made with Country Time and freshly cut lemons and a seasonal treat of Apple Lemonade. I mixed the liquids, added the cinnamon and sliced apples. We iced the beverage because it was a warm day, but it would have been yummy as a warm drink too! You can check out how we built our stand here. Also, there are pictures for our other sales here and here. No, this is not just another lemonade story. This is a story about two girls, two villages, and a goat (or at least the idea of one) that links them all. Beatrice is a girl from the village of Kisinga in western Uganda. Janie Kathryn and I read about her in preparation for a visit to the Heifer Village in Little Rock. We learned that Beatrice's life was changed forever by the gift of a goat named Mugisa. You see, Beatrice's family was one of a dozen families in Kisinga to receive a goat from Heifer International, a non-profit organization whose mission is to work with communities to end hunger and poverty and care for the earth. After reading about Beatrice, Janie Kathryn and I visited the Heifer Village to learn more about how the organization works. Through gifts of livestock and training, Heifer helps families improve their nutrition and generate income in sustainable ways. In exchange for their livestock and training, families agree to give one of its animal's offspring to another family in need. After our trip I reflected on Heifer's truth about food- "There is more than enough food to feed every human being on our planet at this moment. Hunger isn't about the scarcity of food or overpopulation. It's about limited access to food and the resources, like money, necessary to obtain it." Janie Kathryn, on the other hand... Well, there was no reflection. It was full steam ahead and "Let's sell lemonade to buy a goat like Mugisa for another girl like Beatrice!" And so, we did. We invited our village of friends and on the first day of fall we once again set up the lemonade stand, this time to raise money to buy a goat for an unknown village in another part of our world. We asked for $1 donations for each cup of lemonade. Cup after cup, Janie Kathryn poured and I reminded her to tell our customers about Heifer International and the goat we hoped to buy. We went through 40-50 cups of lemonade and lots of pumpkin muffins, cookies, and chocolate-covered marshmallows and we raised enough money to buy two goats. You do the math. We live in a VERY generous village and I feel VERY fortunate that friends, family, and total strangers were so eager to support the efforts of my little dreamer. One of our customers stopped me and commented, "what a wonderful thing you're doing to teach your daughter this lesson." However, I think it is my daughter that is teaching me the lesson. I just make the lemonade. I haven't told Janie Kathryn yet, but I researched Beatrice to see what had become of her. We read in the book that she was able to use money from the sales of her goat's milk to go to school in Uganda. As it turns out she was awarded several scholarships and eventually traveled to the US to attend Connecticut College and graduate school at The Clinton School for Public Service in Little Rock. Beatrice is currently working for Heifer International. I think we just might reach out to her and I'm sure I know what Janie Kathryn will say. Science: It's a Girl Thing? As the summer heat peaks and a new school year is revving its engines, my brain is working overtime on one thing... Christmas! It's maddening I know, but this is the time of year that I begin planning for the year's holliest and jolliest of holidays. Perfectly in tune with my premature planning is my spunky little six year old, who randomly announced that Santa should bring her a science kit this year. Randomly and unprompted, I swear. So, I set out to research science kits- the good, the bad, the dangerous... world of overtly gender-specific educational science toys. While there are plenty of science-themed toys and kits that are not outright marketed towards boys, the first one that I came across was the Dangerous Book for Boys Chemistry Set. And yes, I realize that this product is based on a best-selling children's book. 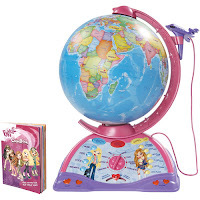 I just have to wonder does the manufacturer of this toy, Thames & Kosmos, realize that there is also a best-selling children's book called The Daring Book for Girls? 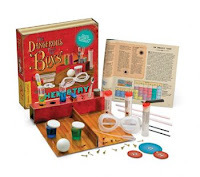 Because there is no such science kit to be found under that title. This little discovery prompted an entirely new search for "science kits for girls." I guess I shouldn't be surprised by what I found. 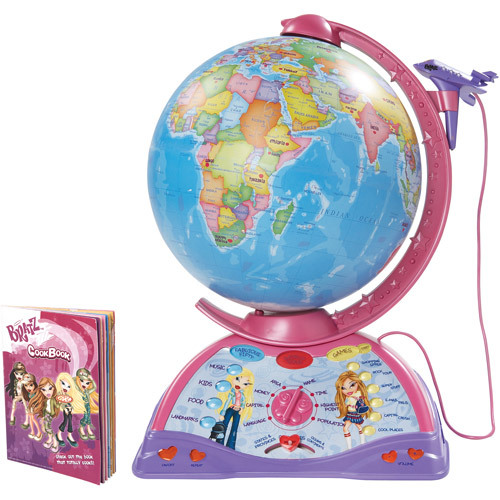 Science sets for girls are packaged in pink and overwhelmingly labeled as "design your own." Design your own perfume, soap, lip balm, mystic "krazy" crystals, and beautiful blob slime. Beautiful blob slime, really?!? Can I buy a set to design my own pink vomit, because that's what I'm feeling right about now? Is there any wonder why there are so few women in science, technology, engineering, and mathematics? Perhaps it has everything to do with the pathetic attempts to to interest girls in science. When life gives you lemons, make teddy bears! Janie Kathryn begged and begged to build a lemonade stand this past spring and Easter weekend we honored her request. It was a fun family project. After a successful first sale that benefited the Mid-South Food Bank, we decided to give it another whirl. Once again we spread the word on facebook and started baking muffins, a fitting snack for a morning cup of lemonade. So many of our friends and family went out of their way to pass by and make a purchase. Many even made donations to Janie Kathryn's worthy cause. She specifically requested to spend her money on "toys for children." So, I guided her good intentions toward the teddy bear wall at The Memphis Child Advocacy Center. After a quick three and a half hours, we sold out of lemonade and called it a day, with $134.50 in revenue. 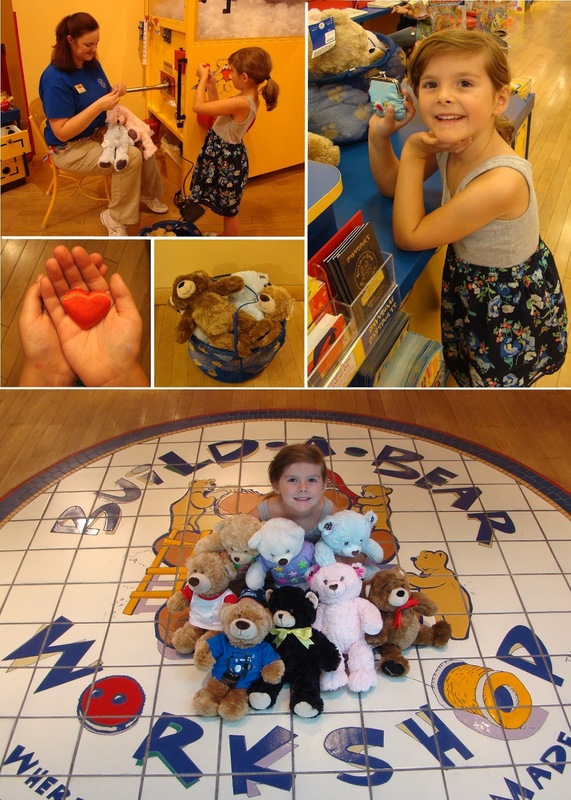 We packed up our leftover muffins and delivered them to Fire Station #21 and headed over to Build-A-Bear Workshop. We arrived at Build-A-Bear and carefully selected eight bears for Janie Kathryn to "build". Each bear was stuffed with a red satin heart before Janie Kathryn filled it with stuffing. Of course, we had to hug each one of them to make sure they were just snuggly enough. Once she gave all eight bears an air bath (to remove lint and loose fur) we headed to the cash wrap, where she paid all by herself. We left Build-A-Bear with two huge, bear-filled bags and headed straight to The Child Advocacy Center (CAC). 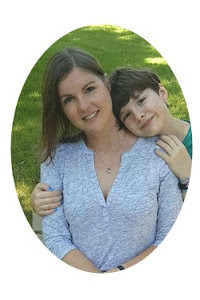 The mission of the CAC is to serve children who are victims of sexual and severe physical abuse through prevention, education and intervention. Simply put and in six year old terms, the CAC is a safe place for kids who might be hurt or scared and in need of an adult that will help them feel safe. The teddy bear wall is stuffed with lots of cuddly bears that offer young visitors a little comfort and security. "Sexual abuse of children occurs in every class, race, religion, neighborhood, cultural and ethnic group." The CAC believes that child abuse is a community problem and no single agency has what it takes to provide assistance to abused children and their families.The organization was one of the first child advocacy centers to house child protection and investigative agencies under one roof. And under that roof employees and volunteers are hard at work promoting the vision of a community where children are safe and families are strong. The Memphis Child Advocacy Center is such a worthy cause. It was such a pleasure to meet Executive Director, Nancy Williams and Donor Relations Specialist, Deirdre Oglesby. These ladies were kind enough to tell us about how volunteers make an impact in the lives of Memphis children. It turns out it's not just Teddy Bears you can donate. Check out these other ways to donate or volunteer for the CAC! When my family was preparing for our Caribbean vacation I found out that our Beaches resort offered several "extras" for which we could sign up. Scuba diving and snorkeling were not top on my list, but the Sandals Foundation Reading Road Trip really peaked my interest. I signed up to take this trip to a local school on the island and read to students, fostering reading comprehension skills. What more could an aspiring teacher ask for in a vacation!? I immediately began researching schools on the islands. I looked for photos and reviews from people who had participated in past excursions. Somewhere in all my googling I came across an amazing organization called Pack for a Purpose. This non-profit helps vacationers help people in the communities where they are visiting. Before departing for a trip, you can go to the Pack for a Purpose website, enter your destination, and search for opportunities to donate much needed medical, school, and craft supplies, clothes or even sporting goods. The website even offers tips on how to best pack your goods to make the most of your space. How cool is that? Since we were able to check three pieces of luggage, I decided to dedicate an entire bag to our purpose-- bringing books to the school that I would be visiting in Turks and Caicos. I was a little late in my discovery of this mission, so I wasted no time finding books to fill that suitcase. We scoured the shelves of the Goodwill Bookstore to find "like new" books. We emptied the gift closet of my stockpile of re-gift books and going-out-of-business finds. I ordered several classroom library sets from Scholastic Book Clubs. When we ended up with 93 books, Janie Kathryn rounded it up to an even 100 by donating a few of her own books. The bag was heavy! Much to my disappointment, my Reading Road Trip ended up getting canceled. Apparently,when were on vacation the students were in the middle of achievement testing. I get that. I still feel good about our donation and my discovery of this great organization. I can't wait to pack for a purpose again. And friends, please explore their website and consider packing for a purpose the next time you travel. Oh, vacation...the good, the bad, the beautiful. Perhaps this recap and review will help future Caribbean travelers. Let's start with the bad...er BAD. I'm not sure which was worse, the airport accommodations on the island or the mysterious virus that plagued the resort and my 6 year old daughter. Well, it happens that the mysterious virus was Norovirus and the Health Department ordered the immediate closure of our resort on the day of our departure from the island. One might say that, "Other than 1 of 8 travelers getting sick, we really dodged a bullet. After all, the resort closed as we were leaving." No biggie, right? WRONG! Apparently, as we were waiting on ground transportation to the airport, 180 travelers were being informed that their Beaches reservations were being transferred to other resorts. Those 180 travelers were about to board a plane in Charlotte, a plane that was bound for Turks and Caicos (TCI) to pick us up and take us back to the U.S. Well, guess what! Approximately 90 of those passengers decided not to board the plane. Unfortunately, their bags were already aboard and for the purpose of security had to be removed before the plane could depart. So, after waiting in the ridiculously long security line (it extended outside and doubled around), we moved into the overcrowded waiting area where we waited for our plane for 4 hours. In case I didn't paint this picture clearly enough... The waiting area was open-air, 90ish degrees, and large enough to comfortably hold about a quarter of the people who were sweating it out. TRAVEL ADVICE: Never travel to or depart from TCI on a Saturday. Traveling on any other day of the week will enhance your vacation experience. Ask anyone who has ever made the ill-informed decision to book a TCI vacation from Saturday to Saturday. This one little bit of advice would have prevented 50% of the BAD parts of the vacation. The other 50%, the Norovirus, is a risk you take when you gamble with buffet food at an all inclusive resort. I'm going to jump right in with my favorite part of the vacation... the gorgeous crystal clear water and the our location in the Italian Village of the Beaches Resort. Seriously, Italian Village is the best. It seems to be the newest. It has the best pool and the best access to the powdery sands of the waterfront. I didn't take any obnoxious photos of food. We mostly enjoyed the various buffet-style restaurants. The one reservation about which we were excited turned out to be a let down- Kimonos. The high-energy hibachi concept is great in theory, but mediocre (at best) in execution. Beaches is expanding this restaurant. So, with any luck it will live up to its potential in the future. Before I continue, I should also mention that this photo of my daughter frolicking in the water was taken by a Beaches photographer. Booking your free 30 minute photo session is a MUST, but be prepared to pay for those beautiful photos! We signed up for several of Beaches' extras. The Island Vibes Kitty Katt Cruise, shown in the background of the above photo, was a much anticipated experience for the whole family. Unfortunately, the Norovirus caused my daughter to miss the boat, along with her grandparents who stayed behind to tend to her poor little tummy. It turned out to be for the best that she was not able to make this trip. Though children are welcome, it definitely appeals more to adults. The snorkeling part of the adventure seemed a bit much for younger kids. The crew limits snorkeling to 20 minutes, which is perfect for newbies like myself, and drinking is prohibited until snorkeling is completed. During this excursion, our catamaran made a stop on Iguana Island, where guests were escorted around the island in search of conchs and iguanas. We decided to skip the reptile-hunting and take pictures instead. The view was amazing! Another extra that Beaches offers is a visit to the world's only conch farm. This trip was a great way to integrate some education into our vacation. I will warn you though, before you get to the conchs, you take a historical detour through the island. And if you have the same guide that we did... he knows nothing about the pre-colonial history of the island. You're better off reading a book. Misguided historical references aside, meeting the locals and learning about the life cycle of the queen conch was well worth the endeavor. And be sure to pronounce it correctly. Saying anything other than "konk" will get ya quickly corrected! Our last excursion was with the lovely couple, Alistair and Betty, who own and operate the Undersea Explorer- Semi Submarine. These two were as delightful as the underwater experience itself. Alistair captained the semi sub, while Betty narrated the beautiful scenery. There were several times when creatures swam by so fast that we missed them and Betty radioed for Alistair to turn us around in pursuit of sting rays, sea turtles, barracudas. This happy duo made sure we didn't miss a thing! That about sums up the trip! Except for "packing for a purpose", which will just have to be another post. For months, Janie Kathryn has been begging to have a lemonade stand. She made her own 6-year-old attempt with a cardboard box, to no avail. So, I promised her that we'd build one over the Easter weekend, using materials we already have around the house. After digging through the shed, we found this gem from years past. It used to a microwave stand. Who knew it could double as a fabulous lemonade stand in its second life? Once I found this forgotten treasure, I hatched a plan and handed off the hard work to engineering, more commonly known as my husband, Jorma...AKA Daddy. We purchased yellow paint and two L-brackets for $8.00. I painted and then put Daddy to work, adding a shelf to the back of the stand (that would soon be the front of the stand). While Daddy was busy with drill, Janie Kathryn and I painted the sign. We used wood from a never-built sandbox that came with our swing set. It was the perfect size and already stained! I was a little concerned about how to make pretty (legible) letters and decided on tracing with a twist. I printed the letters, placing the paper on top of the wood and tracing with a sturdy pencil. Voilà! A faint imprint that allows for a pretty L-E-M-O-N-A-D-E! To save money on spray paint, as well as give my spraying finger a reprieve, I scrounged up some leftover contact paper...leftover from wallpapering the kitchen of Janie Kathryn's dollhouse. I was really pleased with the color scheme! I added a sweet little pom-pom trim, a leftover from sprucing up a lamp in JK's bedroom. The only thing left to do is wait for the Easter Bunny and hope he would bring all the appropriate accouterments for a successful lemonade stand. Good ole EB didn't disappoint! Check out our fabulous first sale! Once we finished construction on our newly re-purposed lemonade stand, I immediately started working with Janie Kathryn on a strategy to attract customers. She thought it was a good idea to add cookies to the menu. After all, Daddy did add that nifty shelf to the stand. I proposed that Janie Kathryn choose a worthy cause to which we could donate a portion of the proceeds. The Easter Bunny did just lavish her with gifts. Her basket overfloweth, why not pay it forward. So, after careful consideration we landed on the Mid-South Food Bank. The plan was developed. It was time to move on to marketing. What better way to get the word out than to spread it on facebook? Turns out a sweet little girl's entrepreneurial endeavor and a worthy cause motivate a lot of friends (and a few strangers) to brave the rush hour traffic to buy a cup of lemonade. The end result was about $117 in sales and donations. Not too shabby for a little lemonade stand. I asked Janie Kathryn how much she thought she should keep. "Ten dollars." Team Skeen was good with that. We also put $15 away to buy more supplies for the next sale. Business lesson #1: You can't always depend on the Easter Bunny to provide your business needs. Did you know that for every $1 that is donated to the Food Bank, they are able to purchase $4 worth of groceries? This adventure taught us a lot! We were able to tour the Food Bank, thanks to Marcia Wells, who kindly took time to show us around. We presented our modest, yet hard-earned check to the President and CEO, Estella Mayhue-Greer. We learned that the Food Bank's Food For Kids Backpack Program provides food for children in our community that do not have enough to eat. We discovered that peanut butter is a hot commodity. The shelf was bare. Will we do this again? Absolutely! Keep an out for our next facebook event notice! Perhaps, there's a peanut butter drive in our future. Each time my Daisy Scouts meet, we discuss a line from the Girl Scout Promise. And every time they learn a new line they receive a petal (patch) that represents the concept. Recently we talked about "courageous and strong". We read a story about what it means to be courageous and strong. We talked about things that we do that require courage and strength. And we watched a short cartoon about people who were courageous and strong. Helen Keller and Rosa Parks. My child really latched on to Rosa Parks, recognizing her in a similar cartoon short about Martin Luther King and referencing her several times in conversations. I was (am) really happy that something she learned in Daisy Scouts stuck. Not for nothin'- all this effort. So, I hatched a plan to nurture this interest in Rosa Parks, combining it with another relevant interest- a desire to ride a city bus. Janie Kathryn is somewhat obsessed with buses and wanting to ride on one. Jorma was not as enthusiastic as I had hoped. Honey, let's take a 40 minute bus ride downtown, transfer to the trolley and check out the Rosa Parks exhibit at The Civil Rights Museum. But when he realized how excited Janie Kathryn was about the idea, he relented. A trooper, that husband of mine. So, we headed downtown. Janie Kathryn's favorite part was riding the trolley. My favorite part was her excited chant, inside the museum, as we stood in line to board the bus with a statue of Rosa Parks. "I'm going to see Rosa Parks on the bus, I'm going to see Rosa Parks on the bus." Note: Janie Kathryn wanted me to break the rules and take a photo of her on the bus, but Girl Scouts respect authority, so no photo. Jorma's favorite part was when it was over. Did I mention my husband is a trooper? If you're wondering if the Civil Rights Museum is age appropriate, I'd have to say no, if your child is six years old. There are quite a few large photographs of noose victims. There was a 10-minute video at the beginning of our tour, about which I inquired about age appropriateness. Yeah, a little inappropriate. After the film, we were the last to leave the theater, explaining why crosses were burned and the police (POLICE!) were dragging women across the ground. "Well, in this world some people are mean just for the sake of being mean. Those people who burned the crosses were trying to make people afraid- afraid of doing the right thing." Here at the Skeen house we like to make our valentines from scratch. Okay, so we like the idea of making them from scratch. The execution isn't always pleasant, but the end result is always satisfaction. This year I found my valentine inspiration on Pinterest, of course. I found this adorable friendship bracelet valentine and thought it would be the perfect project for Janie Kathryn's class and my students as well... all 127 of them. There was no way that we (me and the little one) were going to make 16 bracelets for her class. So, there was like double... no triple... or quintuple no way I was making 127 more for my 2nd-5th graders! I once again turned to my handy dandy search bar and after several trillion searches I found a fair trade company, based in Denver, that sells wholesale quantities of bracelets made by craftspeople in Peru. The best part: all profits benefit schools in Peru. I take 150, please! After splurging on the bracelets (even for a good cause), it wasn't in the budget to buy 150 valentines or the supplies to make them. So, I had to get resourceful. An idea came to me while working on Valentine's Day bulletin boards at school. I was using my school's die cutter to cut hearts and tossing the frames into the recycling, when I realized how useful those pieces of paper with heart-shaped holes might be! The teacher workroom proved to be a valuable resource indeed. I rummaged through the recycling bin and found all sorts of scraps that I could use. A few pieces of pastel copy paper, some die cut scraps added to a collection of half used sheets of heart stickers I had at home... I was ready to get crafting! After all the effort, I have to admit I was a little concerned that it wouldn't be as appreciated as I hoped it would be. I went around, from room to room, leaving my valentines in 127 festively decorated valentine bags. The next day I was delighted to see so many students with bracelets tied around their wrists. I received many heartfelt thank-yous and engaged in several conversations about fair trade and Peruvian crafts. It was a good feeling and a happy Valentine's Day! Mrs. Skeen Loves a Theme! Janie Kathryn was invited to an Alice in Wonderland themed birthday party. When told the guests could dress up, I immediately started searching my mental inventory of appropriate attire. Her Dorothy costume could be converted into Alice easily enough, but the birthday girl would be Alice. Then I remembered a haggard old dress in her dress-up box that would be perfect for the role of Queen of Hearts! So, a few hours before the party, I got to work. I had to hastily sew up several obvious tears. Next I stapled, yes stapled, several playing cards to the inner layer of the dress. Always save your incomplete sets of playing cards, you never know when you might be able to use them! Happy that I found a reason to use my red staples, I also stapled several felt heart-shaped ornaments to the dress -75% off Christmas Clearance find. Then I used felt Valentine heart stickers, stuck to the inside of a gossamer. The sheer outer-skirt protected the accoutrements while obscuring my make-shift, no-sew fastening job. With the addition of one more felt ornament to the front of the gown, the Queen of Hearts began to take shape. It was time to move on to hair and make-up. Both are important parts to a successful off-with-their-heads kind of look. The easy peasy crown was fashioned from half sheet of 12x12, red, glittery scrapbook paper, stapled of course, and finished with a few felt heart stickers and the pièce de résistance- The Queen herself. The heart-shaped lipstick, a heart on the cheek, and a little bit of eyes brought the look full circle. with vulgar paint, the royal flower bed? For painting my roses red, someone will lose his head!"